The Thelemic Cookbook: Cooking with Correspondences was written to provide specialized recipes for the Thelemic calendar of feasts. 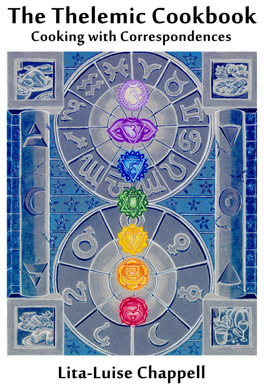 It offers a unique insight into foods by explaining their elements, ruling planets, astrological signs, and chakra attributions. It was also written for those who want to incorporate magical correspondences into their ritual meals, and for any person who wants new recipes with good food for their own cooking and eating pleasure. The author has drawn upon her knowledge of foods amassed over a lifetime working as a chef and caterer, living as a magical practitioner, and collecting a repertoire of international flavors from her world travels. This is not your typical cookbook. Its 656 recipes offer something no other cookbook has: magick in every bite! © Copyright 2015 by Lita-Luise Chappell. All rights reserved.